No, not that music of the Tropical Serenade. Today let's get detailed and talk about the music that played outside of the attraction throughout its lifetime. Tropical Serenade is just about the only WDW attraction which has had an authoritative original BGM available online since the 90s - or, at least, what was widely accepted as authoritative. As part of the early legitimate loops available through collector's circles such as the Main Street USA music, King Stephan's Banquet Hall and Adventureland Veranda, the "Sunshine Pavilion BGM" was vouched for by several sources, and How Bowers recently released a live recording made in the 90s which confirms its authenticity. Co-incidentally, Ryan Komitor, who recently did an incredible job rounding up all of the original Adventureland Veranda music, pointed me in the direction of a fairly obscure Criterion Records release, The Beat of Tahiti. It's unpolished, in situ records of Tahitian drumming, but most importantly it provided the two missing tracks for the Sunshine Pavilion BGM. This loop is commonly labeled as being from 1971, a date I accept in the absence off any more compelling evidence. As I’ve hopefully repeatedly demonstrated on this site, the music rollout at Magic Kingdom for the first few years was messy and sporadic, and nailing down dates is largely an exercise in frustration. However, Disneyland had been using music in the lobby areas of their attractions more or less since the 60s, so I think it’s reasonable to assume that Disney prioritized waiting area loops over generalized area loops and that Jack Wagner would have cranked this out to be ready for the October 1971 debut. If this is true then this is probably his original exotica loop. 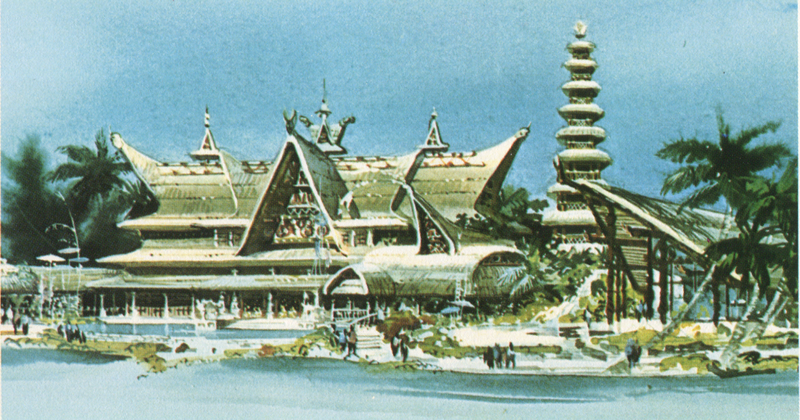 Like other early 70s loops, such as those for the Adventureland Veranda and Liberty Square, it’s a surprisingly conceptual loop, not at all like the aural exotica wallpaper he would create for later Adventureland music projects. We know this because his loop for the Disneyland Tiki Room Lanai, created in 1976, also still exists, and it’s a totally different creature. The Sunshine Pavilion loop intersperses aggressive, almost dissonant drumming tracks with the standard exotica music you’d expect to hear outside of a Tiki Room. What first seems to be an odd choice gains more meaning once you realize that these drumming tracks were not easy to find; the first track, by weirdo experimental drummer Chaino, is a very close edit of a very specific section of one track from one very obscure album. Jack didn’t have much room for error in editing this, because just seconds on either side of the section he used are the sounds of panting and screaming! Two selections from "The Beat of Tahiti”, which is more of the sort of thing you’d expect the Smithsonian to release than a proper music album, are followed by a Martin Denny track which begins with drumming in a similar tempo, creating the illusion that the aggressive island drums fade into an exotica reverie. The final track, another Martin Denny confection, is again heavy on the percussion, climaxing with a flurry of drum beats to herald the start of the pre-show. 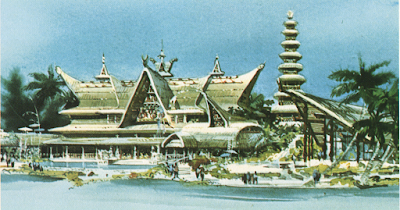 I think the idea here was predicated on the entry area of the attraction being a Balinese pagoda, and perhaps related to the pre-opening term of the central feature of the Sunshine Pavilion itself being a “Ceremonial House”. That is one place you would expect to hear exotic drumming, and threading the exotica music through jazz and authentic folk music recordings is an interesting idea. I don’t think Jack totally pulled off the idea, mind you, but it’s a deceptively carefully crafted piece of work. And, well, that’s what played at the Sunshine Pavilion for darn near a quarter century. It wasn’t until the show was displaced by the Under New Management show in 1998 that anything changed. Under New Management was a bad idea for a bad show, but one element that took the sting out of it was that the attraction received an absolutely phenomenal waiting area loop. In the generation since Jack created his first exotica loop, Tiki culture had died on the vine and then come roaring back to life - right about the same time the Tiki Room had gone UNM. The incubator of the Tiki revival was Southern California, so somebody inside WDI knew what they were up to here. Instead of drumming interspersed with leisurely island music, the new waiting area loop was a glorious crescendo of the patron saint of exotica lounge - Martin Denny. Beginning with a track in which Denny and his percussionists were merely the supporting act to Arthur Lyman, the group’s signature jungle howls and wails build and build, leading up the original single version of Denny’s immortal Quiet Village. The track manages to be fun, kitsch, and melodic all at once while blending a near history of lounge exotica music into a cohesive whole. I worked at Under New Management for a while, and while I can confirm that audiences simply didn’t like the thing, I was pleased that the sacrifice of my sanity for a few months more than prepared me to rebuild this waiting area loop from memory. Oh, and after all of that rich atmosphere building by the music and architecture, then the waterfall opened and the talent agents of Iago and Zazu would bicker at each other. You know, fun! Under New Management was also the recipient of another unlikely first, the first and only Tiki Room to ever have an area loop. This played out of the exactly one speaker situated on the facade pointing out towards Adventureland, and after the construction of the Magic Carpets of Aladdin was mostly inaudible. For the identification and preservation of this information we can thank Jay at Magic Music, who spent many no doubt painful months compiling the data. In the absence of a live reference recording of this material, I don't think a reconstruction is ever going to be possible. As I mentioned, the music was practically inaudible in the park, and the only track I can ever remember hearing clearly is the Guy Lombardo version of Hawaiian War Chant. I'm only halfway positive that the Lombardo tracks were edited to remove their vocals, and unlike with the pre-show music, my memory here is fuzzy enough that I'd rather not trust it. However, for posterity's sake, here is the Guy Lombardo Hawaiian Songs for Dancing album, which seems to have never been re-released in any form, preserved in amber in amazing 1949 low fidelity! In 2005, Disneyland’s Tiki Room got a top to bottom overhaul which included the retirement of the old Jack Wagner waiting area music from 1976 and the introduction of a new loop of Hawaiian Guitar music. This same loop was copied over to Magic Kingdom in 2011 with the reopening of the original show there, where it plays on to this day. That’s 50 years of Enchanted Tiki history for you, and like all of us, there’s a lot of highs and a lot of lows too. Let’s hope the music plays on and on. Do you like exotica and mood music? I've got a treat for you, because there's a treasure trove of playlists and reconstructions just like this as well as other resources over on our Theme Park Music page!